In the intervening 16 months, the nation has been riven by the deaths of four black men at the hands of police: Michael Brown in Ferguson, Mo. ; Eric Garner in New York City; Freddie Gray in Baltimore; and, most recently, Samuel DuBose in Cincinnati. But Glanville noted then and now that deadly interactions with police can arise from the most innocuous of incidents. Garner was resisting arrest for illegally selling cigarettes on Staten Island when a police officer placed him in a chokehold a year ago. DuBose was shot to death last month by a University of Cincinnati police officer after driving away without explaining why he had no license plate on his car. “It could have gone differently based on how I reacted,” Glanville said. How and why Glanville came, in Malloy’s view, to be “hassled” that day prompted questions to a suburban police department, a national magazine audience and, ultimately, the Connecticut General Assembly, about race, class and interactions with police. Glanville told him he lived there. The officer moved on without pressing the issue, never explaining why he had posed a question suggesting a presumption that a black man shoveling snow in the West End was hired help. The officer, police later explained, was investigating a complaint about a black man who had rattled an elderly woman by banging on her door late the previous night, demanding payment for shoveling her walk, a job he had begun and abandoned. Glanville's wife, Tiffany, immediately sent their neighbor, Rep. Matt Ritter, D-Hartford, an email with the memorable subject line: "Shoveling While Black." "Doug just got detained by West Hartford Police in front of our house while shoveling our driveway, questioning him about asking to be paid for shoveling," she wrote. "The officer left when Doug told him that it was his house. There were several other people on our street out in front of their houses shoveling snow at the same time. None of them were stopped for questioning. Just wanted to vent to someone whom we know cares and would be equally outraged." The legislation passed in response to the incident bars a police officer from crossing a municipal border to investigate the possible violation of a municipal infraction. West Hartford bars selling goods or services door-to-door without a permit. West Hartford Police Chief Tracey Gove apologized to Glanville for his officer's failure to explain why he had asked Glanville if he had been shoveling for money. But Gove says the new law would not have stopped his officer from approaching Glanville, since he was investigating a potential threat, not an infraction. Malloy signed a copy of the bill Monday at a ceremony in his office attended by Glanville and his wife. After the ceremony, Glanville said the incident turned into a positive, one that has started many conversations about race, including one that Glanville says he had last week with the Yankees star, Alex Rodriguez. “The biggest benefit for what I experienced is the open arms by which I was able to engage so many different kinds of people who were welcomed to this discussion," he said. 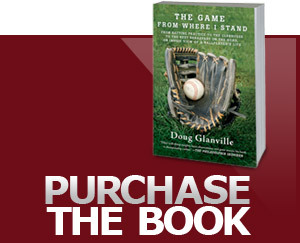 It was the conversation Glanville says he was intent on starting when he wrote the piece for The Atlantic. He is happy that it is continuing. Glanville said he did not intend to demonize the rookie officer or make more of the incident than it was. Republished from the CT Mirror.